Candace H. Johnson-For Shaw Media Rob Sheehan gives a coin to Dave Burgdorf, both firefighter paramedics and divers with the Fox Lake Fire Protection District, after finding it on the bottom during a dive tank demonstration at Grant Township’s Fall Festival on Molidor Road in Ingleside. 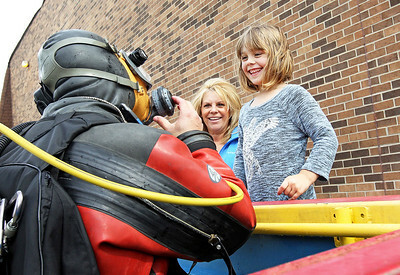 Candace H. Johnson-For Shaw Media Dave Burgdorf, firefighter paramedic and diver with the Fox Lake Fire Protection District shows off his gear to Cindy Tobie, of Volo and her niece, Charlotte Engel, 6, of Grayslake during a demonstration in the dive tank at Grant Township’s Fall Festival on Molidor Road in Ingleside. 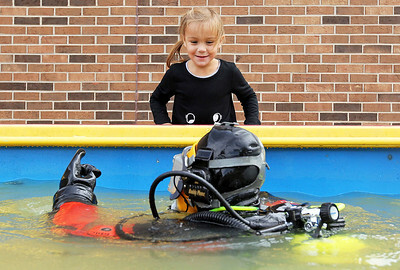 Candace H. Johnson-For Shaw Media Violet Wagner, 4, of Lindenhurst watches Robert Sheehan, firefighter paramedic and diver with the Fox Lake Fire Protection District, give a demonstration in the dive tank during Grant Township’s Fall Festival on Molidor Road in Ingleside. 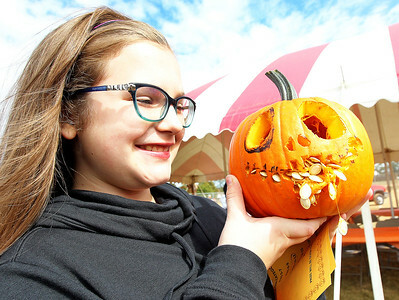 Candace H. Johnson-For Shaw Media Ava Petrik, 11, of Round Lake shows off her 1st place pumpkin in the Pumpkin Carving contest during Grant Township’s Fall Festival on Molidor Road in Ingleside. 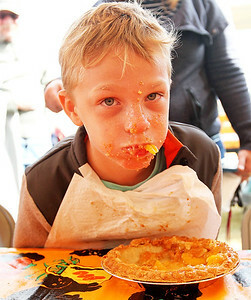 Candace H. Johnson-For Shaw Media Braydon Madved, 9, of Mundelein competes in the Pie Eating contest during Grant Township’s Fall Festival on Molidor Road in Ingleside. 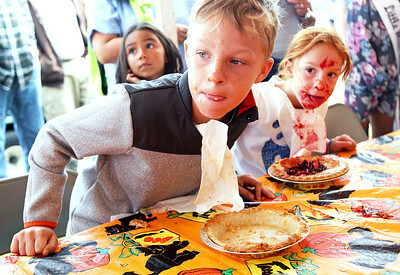 Candace H. Johnson - for Shaw Media Braydon Madved, (center) 9, of Mundelein and his sister, Ashley, 5, keep an eye on the competition during the Pie Eating contest at Grant Township’s Fall Festival on Molidor Road in Ingleside. 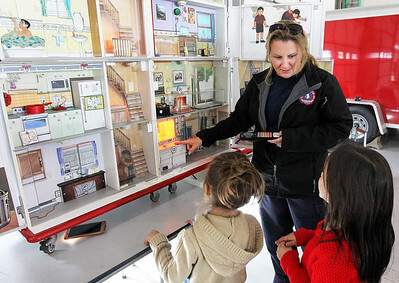 Candace H. Johnson-For Shaw Media Kim VanHoorelbeke, firefighter paramedic with the Fox Lake Fire Protection District talks with Evelyn Haas, 4, of Fox Lake and her sister, Lilly, 6, about the House of Hazards display during Grant Township’s Fall Festival on Molidor Road in Ingleside. 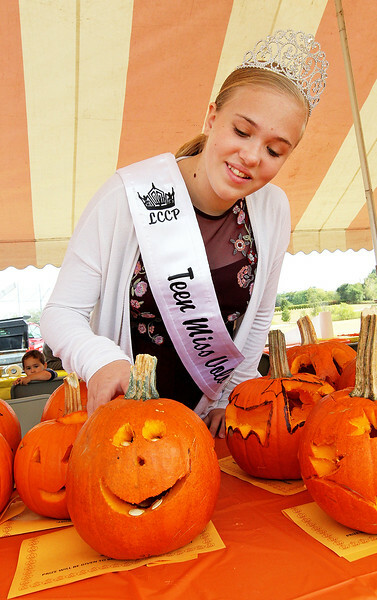 Candace H. Johnson-For Shaw Media Keira Dafnis, 13, Teen Miss Volo 2017, looks at pumpkins entered in the Pumpkin Carving contest during Grant Township’s Fall Festival on Molidor Road in Ingleside. 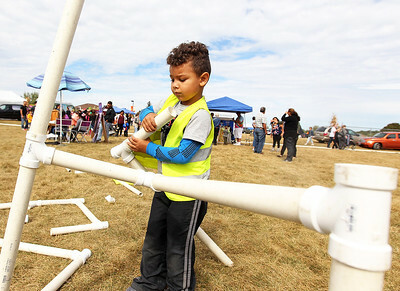 Candace H. Johnson-For Shaw Media Cameron Cherry, 4, of Gurnee plays with PVC pipes in the "Construct!" area provided by the Busy Brains Children's Museum during Grant Township’s Fall Festival on Molidor Road in Ingleside. 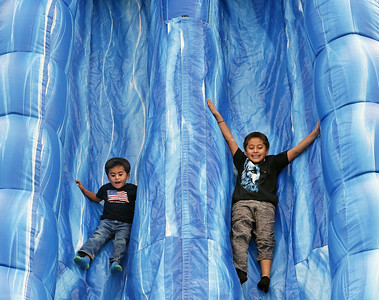 Candace H. Johnson-For Shaw Media Benjamin Lopez, 4, of Ingleside and Prince DeLeon, 8, of Fox Lake go down a giant slide during Grant Township’s Fall Festival on Molidor Road in Ingleside. 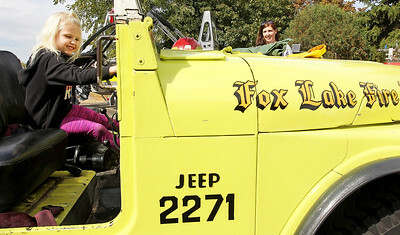 Candace H. Johnson - for Shaw Media Kari Fowler (right) watches four year-old daughter Aubrey of Round Lake Heights play in the Fox Lake Fire Protection District brush fire Jeep during Grant Township’s Fall Festival on Molidor Road in Ingleside. Keira Dafnis, 13, Teen Miss Volo 2017, looks at pumpkins entered in the Pumpkin Carving contest during Grant Township’s Fall Festival on Molidor Road in Ingleside.